[PDF] Why David Sometimes Wins: Leadership, Organization, and Strategy in the California Farm Worker Movement | Free eBooks Download - EBOOKEE! 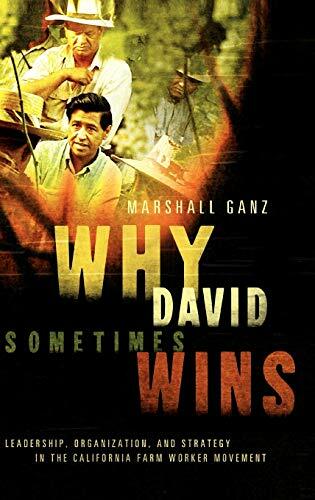 Description: Why David Sometimes Wins tells the story of Cesar Chavez and the United Farm Workers' groundbreaking victory, drawing important lessons from this dramatic tale. Since the 1900s, large-scale agricultural enterprises relied on migrant labor a cheap, unorganized, and powerless workforce. In 1965, when some 800 Filipino grape workers began to strike under the aegis of the AFL-CIO, the UFW soon joined the action with 2,000 Mexican workers and turned the strike into a civil rights struggle. They engaged in civil disobedience, mobilized support from churches and students, boycotted growers, and transformed their struggle into La Causa, a farm workers' movement that eventually triumphed over the grape industry's Goliath. Why did they succeed? How can the powerless challenge the powerful successfully? Offering insight from a longtime movement organizer and scholar, Ganz illustrates how they had the ability and resourcefulness to devise good strategy and turn short-term advantages into long-term gains. Authoritative in scholarship and magisterial in scope, this book constitutes a seminal contribution to learning from the movement's struggles, set-backs, and successes. 2011-12-22David A. Patterson, "Computer Organization and Design"
No comments for "[PDF] Why David Sometimes Wins: Leadership, Organization, and Strategy in the California Farm Worker Movement".